Robert Koenes is senior consultant and team leader of Iventa HR Executive Search, and managing director of Iventa International Management Consulting GmbH. 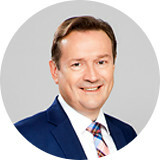 His focus lies on management of the HR consulting team Vienna and International, and in international business development as well as in search & selection of first and second level executive positions. Robert Koenes looks back on 20 years of work experience in IT for German and American corporations, spending 13 of those years as managing director domestically and internationally (Austria, Czech Republic, Italy, Switzerland).